It is no surprise that the current trend for residential kitchens in 2013 is towards a more homey, casual feel and look. We spend so much of our time at home in this room. It is where we plan and create meals, where our family has casual quality time chatting over the morning cup of coffee and juice, where we hang out when friends are over, etc. The kitchen has become the focal point of today's homes. Gone are the days when so many of us wanted the super clean, modern, stark kitchen, where stainless steel and monochrome color palettes were all the rage. Now, many of us are trying to get a more "come on over and stay awhile" feeling in our kitchens. Let's look a few ways you can make your kitchen more homey, whether you're going to gut and renovate, or just changes a few things. It is very common nowadays to bypass the formal dining room and eat meals in the kitchen. You can use space right off the kitchen to set up a casual eating area. You can also build into your kitchen counter eating space by incorporating a ledge or overhand that benches will fit under. A great way to create a cozy eating space is by using seating that is comfortable, casual, and easy to clean. Instead of using all rigid, hard-backed chairs, you can build in a comfortable bench. Homey fabrics like gingham in bright colors gives this bench a casual, pretty look. Underneath, you can have drawers for more storage space, or you can have the bench top lift up under the cushion for storage. Note the matching gingham valence, which creates a casual country feel. If building in a bench is too much work or your kitchen doesn't lend itself to that idea, an easy thing to do is just place a standalone bench against your kitchen islandor against a wall. You can also use a standalone bench in place of a couple chairs at the table. This bench is small, but does add that homey touch and does indeed offer extra seating. A throw pillow in a casual fabric works here. This wrap around bench looks really inviting. The booth concept is really homey, especially in bright, cheerful colors. Again, a couple small throw pillows work with this homey look. As a bean bag chair company owner, I am contemplating creating a kids area off of my causal eat-in-kitchen space. I am playing with the idea of a miniature version of my bench seat and table, but instead of the rigid chairs across from the bench, I could place small size kids bean bag chairs in cute colors and prints for the children to enjoy. I am certain that this kids table would be very popular, perhaps the adults may decide they want to join the kids too! Of course, the bean bags would be ours (ahhprods.com), so the covers would be removable and washable which would be important in an "eating/drinking/spilling/wiping your hands where you shouldn't" situation! This is my eat-in-kitchen space - you can see the bench in the background (lift-up top for storage and cushion for comfy sitting). 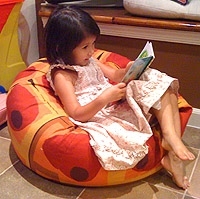 The small sized bean bag is perfect for little ones. They can also be stacked out of the way or thrown in the corner if I need to. In the kitchen above and below, bright, cheery colors are used. You don't have to paint all your walls to add a splash of homey or country/casual colors to your kitchen. You can paint all or just one side of a center island, or just an accent wall. Choose colors that make you feel happy, comfortable, unstressed, and carefree. This fresh sage color is a nice touch in this simple kitchen. I think the glass doors also add a homey feel, especially if you can see recipe books and such through the glass. Instead of cold granite, wood counters add warmth. You can also use a butcher block counter for practicality. If you do go with granite or a stone, opt for a warm color instead of black. Tiled counters are also very warm and lend a cozy feeling. This tile counter reminds me of terracotta, which looks so natural and organic. The backsplash is more exotic and ethnic, in case you want a homey feeling where your kitchen happens to be in Morocco (or you wish it was). I love this center island because it's so simple and rustic. The paint is shabby chic/whitewashed, giving this practical island a country kitchen feel. Use it to prepare meals, and as a place to sit and eat that meal. The wicker bench is a good homey, country touch, but be careful using wicker on seats since you end up having a wicker pattern on the back of your legs if they're not covered! Just like in the kitchen above, this kitchen incorporates wood beams on the ceiling. Nothing says casual and homey more than wood beams to me. They can be added to your ceiling even if they don't actually hold anything up! If you can use distressed or reclaimed wood beams, that's all the better to create a homey feeling. I've always loved wainscot paneling. The vertical panels added to a center island creates a pretty, casual look. Installing wainscot panels can be done as DIY, as the panels are sold in big box hardware stores. Really easy ways to create a homey, comfy feeling in your kitchen is to put flower boxes in the windows. Plant flowers, or better yet plant herbs for cooking. Paint the boxes a happy color, to add more splashes of cheer into your room. What a nice way to start the morning! Stencil your family name or something like "Happy" or "Family" or "Smile" on the flower boxes. Or perhaps the names of family member! For each child's box, have them plant what they want in their boxes for a great craft project that will last for a while! These are 8 of my best and easiest ways to turn a boring or cold kitchen into a warm, inviting, homey place to eat, drink, and be merry! How do you create a homey feeling? Do you use any of these ideas in your kitchen? I'd love to hear how and by all means, send pictures for me to post here!